WINONA, Minn. — The Pages Series at Saint Mary’s University of Minnesota will present Río Mira, an ensemble that specializes in blending contemporary music and traditional sound, on Thursday, Sept. 20, at 7:30 p.m. in the Page Theatre. 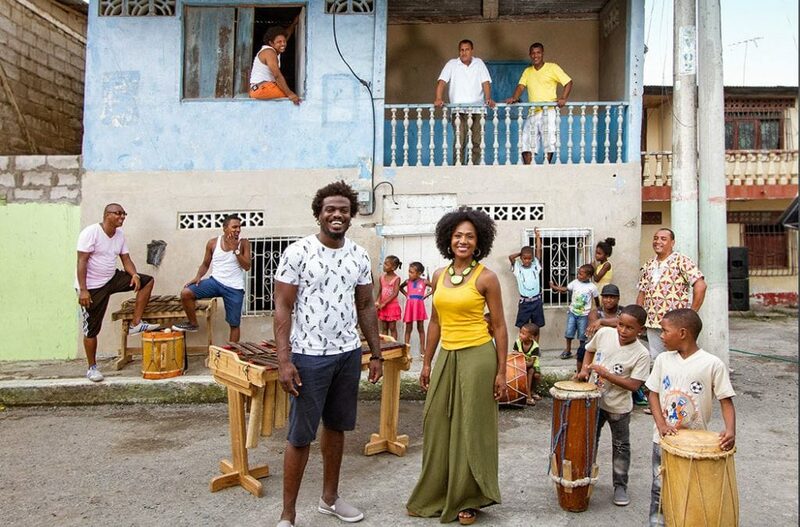 Taking its name from the river that runs from Ecuador into Colombia, Río Mira brings together marimba masters Esteban Copete and Larry Preciado, Ecuadorian singer Karla Kanora, and an all-star ensemble of Afro-Latino folkloric musicians. Bridging borders to reaffirm traditions, the Esmeraldas, an Ecuador-based group, celebrate their shared musical heritage through socially conscious music. With a cultural identity rooted in the East African diaspora traditions, Río Mira produces both folk sound and electro-cumbia remixes that are founded on the mastery and artistry of great musicians and producers from both countries. Their debut album, released on a ZZK’s sub label AYA Records is produced by Iván Benavides (involved in Latin Grammy-winning groups like Choq Quib Town and Gaiteros de San Jacinto) and Ivis Flies (producer of Latin Grammy-winning social heritage project De Taitas y Mamas). To emphasize the history behind this performance, on Wednesday, Sept. 19, at 12:05 p.m., Winona State University professor Juandrea Bates will offer a free Page in History talk at the Winona County History Center, located at 160 Johnson Street. The presentation will provide a historical context for the development of Afro-Latino music, including the different experiences of Afro-Latinos in slavery, plantation work, gold mining, and maroon communities. Dr. Bates will also trace how people of African descent used music and musical traditions to resist the dehumanizing experiences of slavery and, in the process, created a number of fascinating musical traditions like those audiences will hear when attending the Río Mira performance. Tickets to the Río Mira performance are $27 for adults, $24 for senior citizens and students 18 and older, and $18 for youth ages 17 and younger. All Page in History programs are offered free of charge. For more information or to order tickets, visit pagetheatre.org, or call 507-457-1715 (from noon to 6 p.m. on weekdays). This engagement of Río Mira is made possible through Southern Exposure: Performing Arts of Latin America, a program of Mid Atlantic Arts Foundation in partnership with the National Endowment for the Arts. A Page in History programs are made possible, in part, through a grant from the Xcel Energy Foundation and in partnership with the Winona County Historical Society. Now in our 32nd annual season, the Page Series connects professional performing artists from around the globe with thousands of Winonans each year. With events at the Joseph Page Theatre on the Winona Campus of Saint Mary’s University of Minnesota, as well as at locations across the Winona community, the Page Series offers dance, music, and theatre performances, workshops, classes, and more that inspire, uplift, educate, and invite community members to discover the relevance of the arts in their daily lives.